Fenerbahce have tried to blow Sunderland and West Ham United out of the water by submitting a £10million bid for Rennes striker Asamoah Gyan. The Ghana striker impressed at the World Cup and was on the 10-man short list for the player of the tournament award eventually won by Uruguay's Diego Forlan. 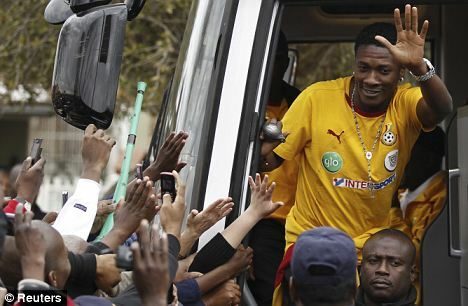 Gyan, 24, is most keen to move to the Barclays Premier League and a move for about £7m had been expected. However, Rennes are trying to cash in on the interest and are understood to have responded to Fenerbahce's offer by pushing the asking price to almost £17m. The Hammers have already stalled their pursuit while they look at Nice striker Loic Remy and Santos wonderkid Neymar, while the new price-tag is likely to be beyond Sunderland.